I happen to be an engineering student... and Steampunk and the glamour I see inherent in machines is a large part of why I chose this path... I wondered if there were any other engineers or engineering students here? (Scientists are great too). If science teaches us anything, it teaches us to accept our failures, as well as our successes, with quiet dignity and grace. I still regard myself as an engineer but I am not sure if I am "here". Much of the time I seem to be somewhere else. ... I imagine you refer to what some would call "having a life", yes? Thankfully, I think most of us spend the majority of our time outside of "here". I began my time in university as a Mechanical Engineering student...and found very quickly that calculus and I did not get along well at all. After several years of debate (while travelling the world at Uncle Sam's expense) I settled on anthropology, and am enjoying it very much. It was during all of these travels that I ran into the steampunk genre, and yes, the themes and aesthetics do affect my public and private life. I decorate as much as I can (tastefully) with Victorian and steampunk themes, and when appropriate I dress in proper Victorian clothing as well. Second, would you elaborate on that last part? Third: Would you call what René Girard does "Anthropology" or "Philosophy"? Product Design Engineering degree, here, which back then was mostly M.E. plus a bunch of design, and not much sleep. Took a long excursion through graphic design, and now mostly work in the twilight zone of UI/UX/Product/Graphic design. Steampunk doesn't really get into my day job, but the engineering and shop background help in the off hours. Electrical Engineer, assessing railway compoments, signalling systems etc by profession, running 0-gauge tinplate and 5" gauge steam in private. Have a homebrew tesla coil in the basement (just something every electrical engineer has to do). Can be found repairing most electrical stuff, never throwing away any device that is beyond repair as it provides valuable spare parts. If brute force does not work....you´re not using enough of it. First, the "edit" button here is labeled "modify" and can be found in the top-right corner of the post in question. Indeed. I find that I always try to dress as a "proper gentleman", despite the common trends of fashion. I've been known to go places dressed in such a way as to make people think I'm going to a costume party or a historical reenactment, and I'm just heading out to dinner with friends or going to a movie. I have taken to speaking as proper a form of English as I can (and constantly work to improve it) so as to sound like a properly educated gentleman, and find it amusing when people constantly ask me where I am from because my accent (or lack of one) and proper grammar do not lend themselves to disclosing my origins. I also hold myself to a very strict form of chivalry, which amuses (and amazes, at times) the ladies whom I pass in public. I open doors for them, lend an umbrella, offer a hand crossing a treacherous parking-lot (the eldetrly lady in question was QUITE impressed with the "fine young man" who was so kind as to offer her assistance), etc. I've taken if from merely a look of clothing or room decor, and turned it into a lifestyle. It seems to me (on brief research) that he is an anthropological philosopher (amusingly enough, that's what Wikipedia calls him: http://en.wikipedia.org/wiki/Ren%C3%A9_Girard). I'm still an anthropology student (with a focus in archaeology ) so I'm not very familiar with him (at least not yet). I shall have to read some of his works though, as several of his texts seem intriguing to me. You won't be able to edit your post just yet, you need to advance at least one rank to do this. This is done by spending time on the forum (not through post count). Civil engineering student, a girly one at that! @Edmund: We appear to be birds of a feather, you and I, sir. I am surprised to find that most of the things you have said about yourself happen to apply to me as well. Though I aim for a more... international... kind of "proper gentleman"... with a strong aspect of "bohemian". I certainly dress the part, and am always depressed when my acting chivalrous is seen as exceptional rather than as what should be the norm. And I certainly hope that you find Girard's theory of mimesis interesting. @Boltneck, The Bullet, Cubinoid and Ava: Thank you for joining us. Is your interest in Steampunk related to your fields? Self taught engineer....design and build pneumatic machinery design and build molds for plastic sheeting in said machines..... can figure out and repair most mechanical divises..... I do have an Associates Degree in Gun Smithing.... Trinidad State Jr College (Colorado) class of 81.. Naval Architecture student, hence the obsession with airships and sailing. There's certainly a shortage of airships in this century. There aren't even good reasons for that, Helium is easy to make, and there are lots of lucrative applications. I guess I'm an engineer, more or less. I have an HNC in Mechanical Engineering, generally agreed in Britain to be equivalent to "almost a degree". Obtained, courtesy of (as it was then) British Railways, Chief Mechanical & Electrical Engineer's Department. This involved spending four days per week "on the tools" in the workshops, so becoming "almost" (there we go again) equivalent in terms of skill & experience to a journeyman fitter. There was a surprising amount of work with basic hand tools - files, hammers, chisels - in the repair and maintenance of steam locomotives, very much a hold-over from the era of Victorian engineering into the 1960's; I guess I was Steampunk before there were Steampunks. The remaining one day, and one or two evenings, per week were known as "Day Release", and spent at the local College of Further Education, studying subjects such as materials science, thermodynamics, drafting, etc. I swear, the instructors there were paid to make Engineering - a field that should have been endlessly fascinating - as dull and mundane as possible. Endless hours spent studying the Carnot Heat Engine Cycle (which doesn't correspond to the actual working cycle of any real engine) and Finite Element Analysis of the Bending Moment of Cantilever Beams seemed, in retrospect, to have little real application to the practical business of designing and building stuff. I've probably forgotten most of the theory - although I'm sure I could go through the motions if I was ever called upon - but the practical skills have stayed with me and proven to be of constant usefulness; and, indeed, most real-world engineering design (I except aerospace) seems to consist mainly of "There, that looks about right" with occasional moments of "H'mmmm.... I guess we need to make this component stronger." That's what testing labs are for, after all. Many years later I obtained a B.Sc. in Geology and M.Sc. in Oceanography, so I guess I'm both an Engineer and a Scientist. I've worked in a variety of jobs, not all of which really required my academic qualifications; jig & tool designer for Rolls Royce, mining geologist, oceanographic/electronics technologist, sailing instructor, boatbuilder, security guard, professional model builder, woodworking shop manager and, for two insane weeks, hypnotist's assistant. If I'd stuck with one field I could probably have retired comfortably wealthy, but as it is I can look back on a, shall we say, interesting life! People can expect me to look business-y all they feel like. I go out on sights in bustle mini-skirts and 14 hole doc martens. I am girly in a proportionate measure to the engineering I do! The more engineering, the more girly! Well my profession is lecturing on music technology, all aspects of recording, film making and photography. I am in a band of music making steampunkeryness called Moth, and make steampunky music videos and steampunkish photos...so, I suppose the correct answer would be, "in a way, yes." In my professional life I consider myself to be an Engineer, and it was in my job title at one time. However, for some reason it has become fashionable (at least in the UK) to call people who do what I do "Designers". When my employers imposed this change I did ask whether I should start wearing frilly shirts and a velvet jacket, sadly they said "no". I should add I mean no offence to any genuine Designers (who I expect number many around here), I just don't think that is the right term for what I do and that drove me to reference a stereotype for humourous effect. @Cubinoid: All aspects of music technology? Do you double as a luthier then? And, thermodynamical impossibilities aside, I take it as a given that everyone here enjoyed that film, Steamboy? 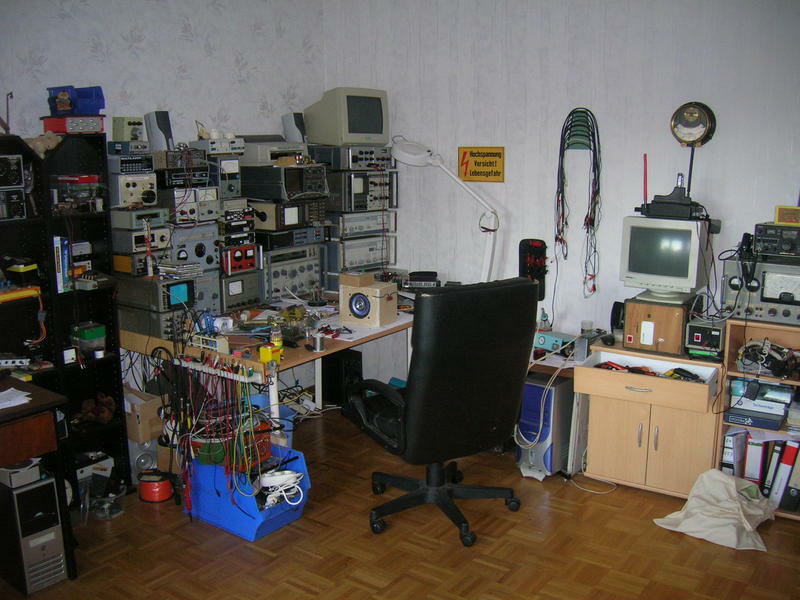 As some folks seem to be interested, here´s a picture of my lab (in its usual "Work in Progress" state). Most of the instruments are more than 20 years old and have been saved from scrap. They are old but still very precise. Some were purpose-built by me to suit my requirements. The blue box under the table contains spares (what other people might call junk). I have tested one of these. Colourful display, one Button AUTORANGE, and if this does not work you need to find your way through several layers of menus to get the signal properly triggered. I prefer the old scopes. Just turn a few knobs and you have it triggered manually. (if you know how). Not even a little bit. Well, only just. I chose to train to be a specialist in incorporating Victorian structural elements and design into modern buildings.